The FreeGo Hawk Step Through electric bike offers great performance and value. 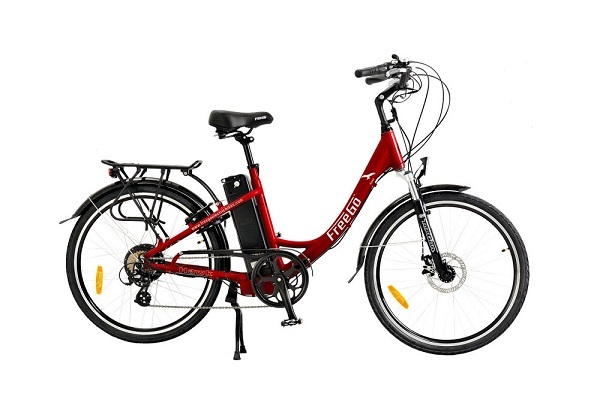 Packed with features, it is the ideal city bike. 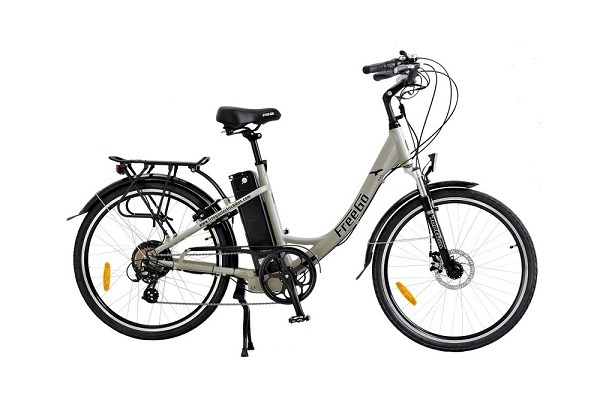 The FreeGo Hawk stepthrough is one of our best selling electric bikes for good reason! It has been carefully designed to offer a comfortable and enjoyable ride as well as excellent value for money. A robust aluminium frame, which is guaranteed for 4 years, is complemented by a powerful and reliable Lithium ion battery which is guaranteed for 2 years. The motor and electrics come with a 1 year warranty. A comfortable saddle and upright riding position make the FreeGo Hawk an ideal leisure and commuter bike; especially as it is keenly priced to falls just inside the ‘cycle to work scheme‘ limits. Five power levels of pedal assist allow you to choose how easily you want to power up those hills. If you like to arrive at work fresh and relaxed you can power along with virtually no effort, but if you feel the need to put in more effort or have a ‘work out’ there are seven well spaced gears to help you along. The FreeGo Hawk stepthrough electric bike is available as a step-through, and also as the FreeGo Hawk crossbar version. 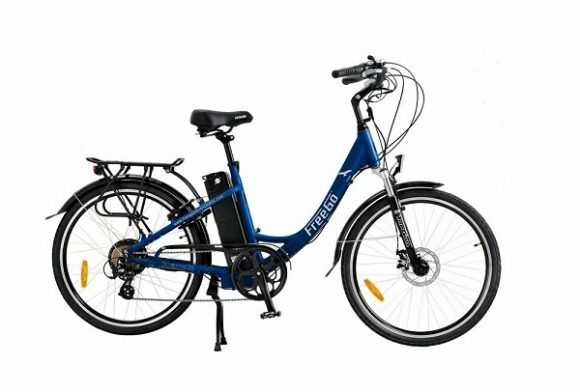 Both have a powerful 36v battery combined with the robust frame; most bikes in this price bracket only come with 24/26v battery making this bike exceptional value for money! If you would like to treat yourself to a bike with extra features then you could not do better than the superb FreeGo Eagle, or the stylish and elegant ‘Edwardian style’ FreeGo Regency, which comes complete with wicker basket and skirt guard. The FreeGo Hawk is also available in a 24″ wheel size version called the FreeGo Wren. Why would you buy the FreeGo Hawk stepthrough? The FreeGo Hawk stepthough is the perfect commuting and city bike, as it is capable of powering you along at 15mph with very little effort if you wish. This is important if you need to arrive at work fresh and sweat-free. For example, an average three mile commute would take less than 15 minutes and would cost less than 1 pence in electricity. It is also excellent as a leisure bike as its strong build and puncture resistant tyres can easily handle most tracks and trails. The FreeGo Hawk stepthrough offers an excellent warranty (one of the best in the industry) backed up by the service and repair facilities of Ebike Centres in Leicester city centre. Come and try the latest FreeGo Hawk now at Ebike Centres. Take a free test ride and see the difference it can make to your life! Lockable Lithium-ion 36v battery. Choice of Samsung 10.4 Ah (standard) orSamsung 16 Ah (super range). Can be charged on or off bike. Full charge in 4 – 6 hours. 80% charge in approx. 90 minutes. Diameter 26", aluminium deep V twin wall rims for extra strength. Stainless Steel Spokes. Yes; 'Top Gun' suspension fork of a comfortable ride. LED front and rear lights, with rear brake light. Runs from the main battery. Aluminium lightweight rear rack with sprung holder. Approx. 20kg carrying capacity. Brilliant little machine! Honestly the best purchase I have ever made! I've done 450 miles on my Hawk so far, it has just been in for its first service this week and is putting up with its very heavy workload admirably- I'm commuting 20 miles every weekday on it. 10 there, 10 back. The battery can do it on one charge but I charge it at work anyway which is really easy to do. Before I bought my eBike I was cycling from home into the city then getting the bus the rest of the way to my workplace in Countesthorpe. I was spending approximately £60 a month on bus tickets and getting to work tired, stressed out and (on several occasions, despite getting to town in time for the earlier bus) late. Having had absolutely enough of buses, I started looking for other options- my first thought was a folding bike, so if the bus broke down partway I at least had another option. Then I stumbled upon the eBike shop, had a test-drive on the Hawk and absolutely fell in love with it. I hadn't previously been able to consider cycling the whole journey. I'm 25 and in reasonably good shape but I'm very asthmatic- I would never have made it 10 miles in a reasonable time having to get off and push up every hill. Now I'm cycling all the way to work and back every day without breaking a sweat (along pretty, traffic-free cycle routes to boot), able to wake up later (I've shaved a good 20mins off my commuting time), in on time without fail and spending £30-odd a month paying back my interest free credit instead of double that to the bus company! The only problems I've had with it are a slight speedometer issue (which doesn't affect performance and is being sorted out) and the little rubber feet falling off the kick-stand, but those have been replaced now and with a bit of evo-stik I'm confident I'll have no more trouble there. The guys in the shop are brilliant and always very helpful. Really my only regret is not buying one sooner. Also do buy one of the little convex handlebar mirrors, they're wonderful on the roads. FreeGo Hawk - touring in France My wife and I bought two E-bikes a Freego Hawk and a Wren and are absolutely delighted. We took them to the Gorges du Verdon in Provence and were able to see the most stunning countryside navigating hills that we would never have been able to climb on ordinary bikes. Then we had a beautiful ride all the way along Lake Annecy. We have also taken them to the New Forest and had some wonderful off road rides on the numerous cycle routes there. We strongly recommend these excellent bikes. Free go Hawk Step through I've had my bike for six months now and am very very pleased with it. I purchased it to mainly commute 15 miles return journey every day. As a 'workhorse' bike it performs brilliantly even with loaded panniers. The upright seated position is very comfortable and my padded shorts and leggings haven't been used since I have had this bike. The only negative I must mention is the weight - it is extremely heavy! However I'm sure as technology improves and price falls, when I come to upgrade my bike in a few years the bikes will be lighter with same power and similar low cost. Keith, Liam and their apprentice Adam give a first class service in the shop - and not just pre sale but nothing is too much bother for them post sale also. On my maiden ride home after picking up my bike, Adam happened to be cycling the same way and rode out of his way to continue to chat with me about the bike. Whichever electric bike you choose I would absolutely recommend ebikes leicester as they give brilliant service, advice and help in anyway they can and are always ready to say hi whenever I pop in on my way by. I tried about 10 different electric bikes at various outlets. The Hawk was by far the best for me and also priced competitively. I like the upright riding position and the saddle is very comfortable. The combination of padded seat, chunky tyres and suspension makes the ride quite smooth, even on our bumpy country roads. Since buying it I have done much more cycling as this bike gives all the pleasure of cycling and none of the pain. Despite being a certain age with a wonky knee and dodgy shoulder I can manage quite long rides with ease (18 miles today) and have even conquered Peak District hills. I take this bike on holiday on the back of our motorhome and it makes light work of trips out for shopping, sightseeing or just riding for pleasure. The extra low gear is a great bonus and it is perfectly possible to ride this bike without using the battery, although I wouldn't recommend it up a hill. I was careful to condition the battery as recommended by flattening it 3 times and found that it will do around 35 miles on one charge. I've recommended this bike to all sorts of people and one of my friends has already bought one. Liam is very patient and will explain everything very clearly, unlike another shop I visited. I'm not a well man, and I often struggle with cycling. I'm fine on the odd day and for a short distance but get fatigued rather easily. I suffer from Crohns disease and can get "caught short" on bus journeys (which take ever longer due to roadworks these days). I do, on most days, manage to do some voluntary work which I find beneficial to my general well-being. I visited Liam and Keith to undergo a series of test rides to see what this E-bike business is all about, and within a moment of stepping through the frame, and sitting on the saddle I was very happy to ride this bike. Yes, it's a lot of fun, but it's a massive boon for those with a condition such as mine. Most of my commute to my voluntary work is on bumpy cycle paths and this smooths them with ease, it's quick too, unlike the bus which is dependent on road conditions, I now make my journey in a consistent time. If I am feeling ill I can use the throttle and the bike does the work for me. Been riding it most days now (when I feel well enough to do my voluntary work) for about 6 weeks and it's coped with all weather, and I arrive with a smile on my face, and on time! Recommended. I bought an un-powered push bike with the intention of getting into cycling for exercise but found it too hard (you have to be quite fit to start) and consequently rarely used it. I walked past the E-bike Centre nearly every day thinking they looked really exciting but took a year to actually try one out. I wish I'd done it sooner! As soon as I got on one for my trial ride round Dover Street car park with Keith from the shop and twisted the throttle I had that "Wheeeeeee" moment! It was so liberating to be moving without the strain associated with a push-bike. I've had my Freego Hawk almost 6 months now and use it so much - to shop around Loughborough, for leisure rides or to get to Leicester (13 miles - something I would never have even dreamed of on a push-bike). The only negatives I have personally are that the saddle is a bit uncomfortable after 15 miles and it is heavy to maneuver when you're not riding it e.g. round those ridiculous gates/chicanes they insist on putting on cycle paths!. Otherwise I find it very easy to ride even without power. It's great having the throttle to pull away quickly from traffic lights then I can cycle using just leg power or Pedal -assist. The guys at the E-bike Centre are great, very knowledgeable and helpful and I would really recommend that you go and try out as many as you need to to make a decision. I’m in my early 60s and live in Beeston. I travel into Nottingham to work 3 days a week. I used to cycle to work a lot and then the demands of work made it harder and I stopped. The current tram works in Beeston were making the bus journey longer and longer, a friend had bought an electric bike and extolled its virtues and, once I had overcome my sense that it was ‘cheating’ I thought it would be a way of getting some fitness back and beating the traffic queues. To that end it has been great! I was impressed with the set up in Leicester and Liam was patience personified in letting me ride everything in stock until I was sure that the Freego Hawk was the right one for me. Great service. I bought the Hawk mainly because of the seating position, nice and upright which means no pressure on the wrists and shoulders. I use it for work and for shopping now. First the positives: it got me cycling again; the combination of the different power settings and gears means that I can always find a pedal cadence and effort level for any conditions; the power ‘kick’ at start off means that you can pedal very slowly and set off again quickly without losing balance; the battery is tough and holds its charge and its unlikely to be stolen. Next the neutrals: it takes a bit of getting used to, if it’s your first e-bike don’t expect to just get on and set off into heavy traffic; it is very heavy and I would hate to ride it without the power on; as mentioned by a previous reviewer I wouldn’t want to try and lift it onto a train; I don’t find it as maneuverable as my push bike; the saddle was not particularly comfortable. All these however make it rather unattractive as a target for thieves! Finally the negatives; one trivial one more serious. The front light is fixed on a bracket over the mudguard. I have found that if the nut on the bracket is tightened enough to stop the front light falling over the bracket then grips the mudguard too tightly and in turn this scrapes on the wheel. More seriously (and potentially dangerous) is that, in my experience early on, it is too easy to accidentally switch on the throttle button and not notice. I would suggest that this part could be redesigned as it could contribute to an accident. Overall the bike doesn’t make my heart sing, it’s a bit too heavy for that! But I am glad I bought it and I would recommend it to someone who would like to start cycling again and who is deterred by the traffic, a sense of not being fit enough and/or the feeling that they don’t want to arrive at work in a muck sweat! I think the service form Ebike Centres in Leicester was great and would completely recommend buying a bike from them. Buying a good bike is always an investment. Buying an electic bike is a commitment too. Because of this, I have been back and forth to Liam and Keith in Leicester E-Bike on Granby Street to make sure that I made the right purchase. The Freego Hawk Step-through is one of the most fun purchases I have EVER made. £999 is very reasonable given the benefits - I was going to buy a moped - the Hawk is so much better - no MOT, Tax, Road insurance, Petrol etc yet I can zip to work and back in a jiffy! More than pays for itself in a year, even buses are expensive these days. This bike is fab for the casual cyclist - nippy for city traversing, comfy enough for casual sightseeing, and powerful enough for a commute to and from work. Because of the weight (that's why it got 4 stars) I think it would be pretty difficult to load onto a train easily, but that's just me. I'm not the strongest person. It also comes with a sturdy central stand which is great for storing at home. Despite the weight (to be expected with a motor and battery), I was very impressed how easy it is to ride, even with the power switched off. The brushed motor means there's little resistance despite the weight and the breaks are second to none. First gear makes hills so smooth. Now. Switch on the power (easily accessible controls). Turn the pedals part rotation, and off you go! Setting 1 (5mph) assisted peddling is great to coast along with Setting 2 (10mph) is definitely great for such little effort Setting 3 (15mph) well. All I can say is, move over moped! The throttle is easy to switch on and off and super smooth to use and can still be used when pedal assist is turned off. Great for moving off or simply floating along as if by magic! The Hawk looks great and the battery is deadlocked in place so there's no chance it's going to go "missing". The handlebards are fully adjustable and the upright-seated position is so comfy - no pressure on my shoulders or elbows. Very different to a normal bike, takes a bit of getting used to - more from an intuitive POV - not used to the bke doing the work for me! but it's kind of the equivalent of power assisted steering and no power assisted steering! (Yes - I had one of those tanks). I'll miss my old bike but I have to say, I don't want to go back! When I eventually gave in to the idea, I bought the bike (e-bike offer 24 months 0% finance) and went for a ride. 1.5hrs in fact. It was heaven! Can't wait to start using it daily! The guys at E-Bike are very knowledgeable and I got tons of very valuable bike advice - even before I had even decided to purchase the bike. I always ask a lot of questions, and was always satisfied with the help and advice offered. I really do love my bike! Thanks guys! No more buses for me for those hard-to-reach locations. I've had an electric bike with a lead acid battery for a couple of years. It's great , gets me to a from work no problem. I had the added bonus of buying it through a cycle to work scheme , which meant the bike and gear was all tax free. Last week i took Liam up on the offer of a free test ride and went out on a few of his bikes. what i really liked about this one is the upright position, there's no hunching over the handlebars. The easy click gears made it very simple to select the right one and of course the big comfy saddle :) . This was much lighter than my bike, i don't have drive or alley so have to carry mine through the house, eith it being Lithium it made it that much lighter. i'll try and review a couple of the others as i know how difficult it is to try and judge because there seem to be so few reviews out there.